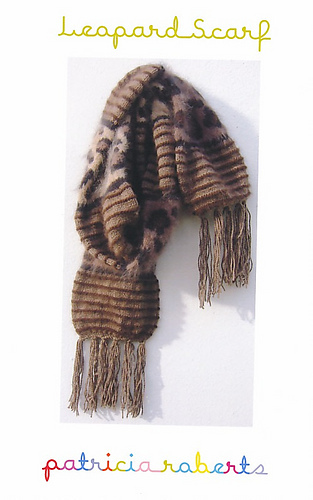 The Leopard Scarf is a variation on the Patchwork Scarf by Patricia Roberts. It features alternating blocks of garter stripes and charted leopard spot intarsia. 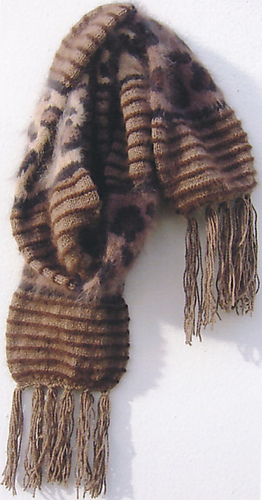 Yarn requirements are 2 x 50g balls of Lambswool No 2 in the main colour plus 2 x 25g balls of Patricia Roberts Angora in each of the 4 contrast colours.